Holy moly! DYPB – Discover Your Personal Brand is just 2 DAYS AWAY!! Have you got your tickets yet? This is the biggest summer leadership event in Toronto and now the largest gathering of personal branding experts in North America. Join 450 leaders, 60 experts for 8 keynotes, 8 workshops and 8 panels on Aug 14-15 in Toronto, Canada. Here is the FULL PROGRAM so you can see how frickin’ AMAZING the line-up is. Use my code BobbyUVIP40 to save 40% off. Only $85 for regular tickets and $65 for students. Incredible value for 2 days. 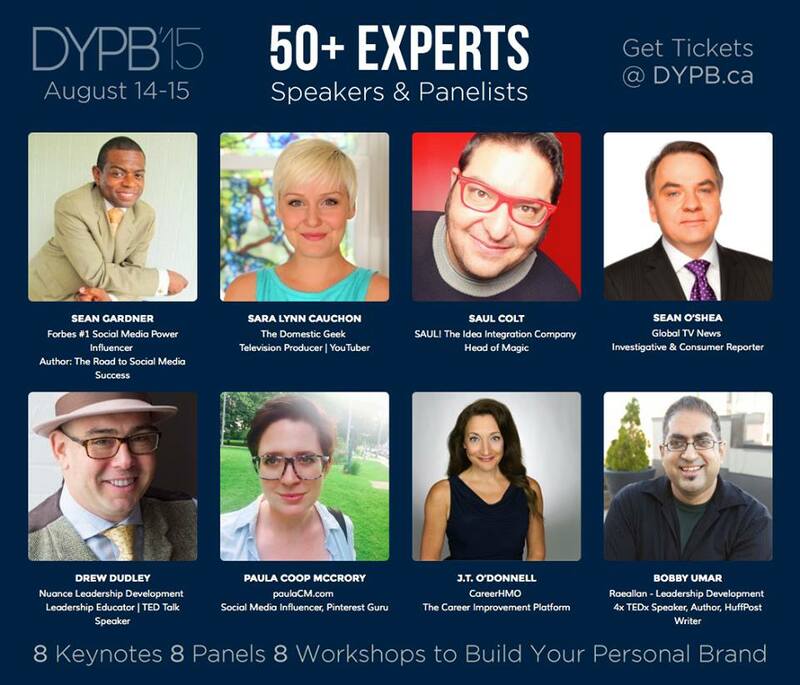 Here is the lineup JUST for the Aug 14 Friday night portion of DYPB ‪– Discover Your Personal Brand conference Aug 14-15 in Toronto. This is the largest conference for Personal Branding in North America and the biggest summer leadership event in Toronto. And that is just Friday night. There is another FULL day of workshops and panels and keynotes with 50 more experts on Saturday Aug 15 too. Join 450 leaders to network and see 9 keynote, 8 workshops and 8 panels. Have you ever felt lost as a leader? Are you trying to find a corporate career path that makes sense for you? Are you an entrepreneur who is looking to find your voice? Are you a student who wants to make sure you have chosen the right academic path? At DYPB15, you will spend an opening evening + a full day with some of the most insightful and passionate personal branding leaders in the industry. They will be sharing their personal stories and key insights and tools on how you can set yourself apart, become a valued leader, and connect to a deeper purpose and drive within yourself. Saturday registration opens at 8 am. The conference will run from 9:00 am to 6:00 pm at OISE, University of Toronto. Use my code BobbyUVIP40 to get 40% for both days! Only $85 for full access. 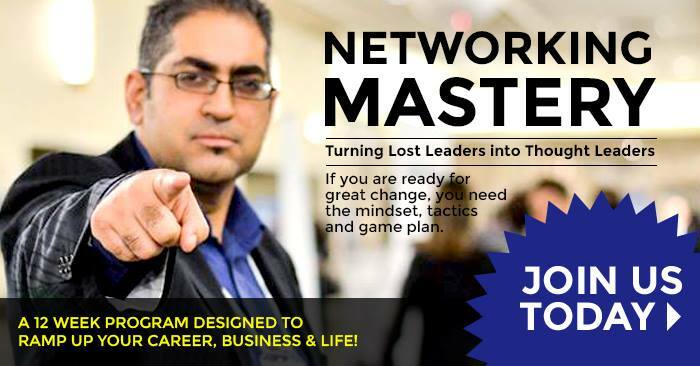 Want a FREE trial of “Networking Mastery: Turning ‘Lost Leaders’ into Thought Leaders? SPECIAL ANNOUNCEMENT: Want to know more how my new “Networking Mastery” program works? I’m doing a LIVE Free Trial Monday, July 20, 12:30pm! I am going to share a portion of one of my favourite sections of the 12 coaching modules in “Networking Mastery: Turning ‘Lost Leaders’ into Thought Leaders”. It’s going to be LIVE and I will take ANY question, along with share a SPECIAL BONUS for anyone who joins us. These 30 minutes will give you some rare insight into the exact CONTENT that I share, how I do it and why it’s so relevant to ramping up your career or business. These modules are essentially the 12 best keynotes from my last 10 years as a professional speaker on Leadership, Networking, Personal Branding and Social Media. Plus you get a chance to engage me with any questions about networking, social media and personal branding, the program, the bonus, or anything else you need. It’s FREE for you to check out. 1) The Definition Of Hell For Each Myers-Briggs Personality Type – Let’s start with some FUN! This article was jaw-dropping perfect! Most of us know Myers-Briggs. Heck, I have been an ENFP ever since I first found out in 1994. Knowing all the other types, including my friends who fit each type, this really had me laughing. 2) The Disease of Being Busy – This is a long one, but a VERY important topic. We’re all busy, but we all can make time for things that are important. 4) Fixed vs. Growth: The Two Basic Mindsets That Shape Our Lives – This is huge part of how I work with people. If you really get the Growth Mindset, you can apply it to anything, including why bold and audacious moves are better for your life. 5) THE Monday Morning Video. *Warning a little Cursing* – YES! BOOM! I meet so many people who don’t like Mondays, or celebrate Hump Days or thank God it’s Friday. Each time I say, “You are in the wrong leadership path, if you feel this way”. Gary Vee hits hard, but hits a knockout. 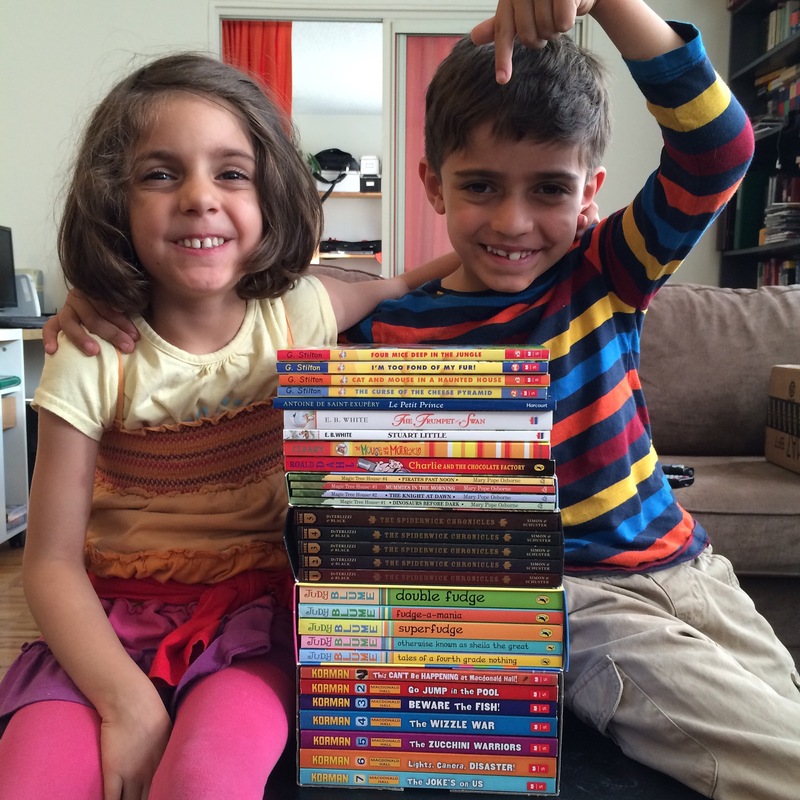 6) Generation X’s Parenting Problem – My kids are now 4 and 6 so I would be re-miss if I didn’t share a bold parenting post. This also resonates with me since I am Gen X and I know way too many of the references here. I mentioned in January I was working on something big. Well, it’s ready. It took me 6 months. But it’s ready. It’s bold, audacious and I am both excited and nervous. And it’s now ready. If you have ever felt ‘lost’ personally or professionally, in your career, small business or academic path. If you want to live a purposeful life, yet you’re not sure how to best navigate and ramp things up. If you wish that someone could just ‘hold your hand’, show you what is possible and inspire you to ‘fly’ on your own. This is IT! I took ALL the greatest content from the last 10 years of my work — in Authentic Networking, Deep Connection, Social Media, Personal Branding, Content Creation and Thought Leadership – and put it all into a comprehensive 12-week online platform. I’ve essentially put 12 of my signature keynotes/workshops into one big package, designed to help ramp your career, boost your business and take your leadership engagement to the mastery level. Interested? Check it out HERE. My Special LAUNCH OFFER will not last long. Have questions? Call/Email/Tweet me anytime. Know someone who could benefit from this? Please share with them. DYPB – Discover Your Personal Brand conference Aug 14-15 – This conference is happening again for the 3rd year in Toronto. We are now the biggest North American conference dedicated solely to personal branding. 2 days, 450 delegate, 50+ experts, 6 keynotes, 7 panels and 8 workshops. Those of you in my network get 40% off with my personal code BOBBYUVIP40. Early bird tickets end July 7 so get them now and save a further 30%. Register HERE. Be Seen (Vulnerability) podcast – I recently was a featured guest for ‘Where There’s Smoke” and we talked about Vulnerability, one of my favourite topics. Check it out HERE. “How to Land Your First TEDx Talk ~ Free Webinar series – I recently started doing free webinars on a variety of topics to support leaders. This one that shows people how to get on the TEDx stage (since I’ve done 4 TEDx talks) was the most popular. So I am doing it again on July 7 at two different times. You can register for either the 11am slot or the 5pm slot, ET. #InspiredToPostIt and daily VIDEOS – One of my new initiative is to just share a daily thought on a post it note (on FB & Instagram here) and to share a video every day (via FB here) on something that inspired me. Let me know what you think of them? #FitInMyLife at Body Invest – As part of my health journey, I recently started working out at Body Invest, where they put you in a full bodied vest. This attached to a machine which uses EMS (Electro Muscular Stimulation) to enhance your workout with less impact on your body and joints. So far in 1 month, I have lost 9 lbs and 2% body fat. We’ve been working together to offer special trial sessions to anyone in Toronto that is interested. If you are, please just message me back and I can hook you up so that they can literally hook you up! You can learn more at their website. I’ve struggled lately with a bad back for 2 months now, but I am getting better. Power of Success Event, featuring Tony Robbins, Les Brown, Barbara De Angelis and Bob Proctor, Sept 16, 2015 — This event is coming to Toronto. If you like even ONE of those people mentioned (there are more speakers), I’ve been able to secure for you a limited number of advance tickets for $100 off – so only $97 for a general registration. Register through this link HERE. On a brief personal update, my ‘Super Daddy Time’ has gone very well. I stopped teaching a night class and every day, my smartphone alarm goes off at 5:30 to focus on my purpose. I love spending every morning, evening and weekend with my family – Ananda, Nyal (6.5) & Ryah (4.5). Father’s day was incredibly fun, with oodles of notes, gifts and more. This summer we’re exploring a variety of camps with them – musical theatre, dance, science, gymnastics, French and adventure – to see where their passions lie. I can’t wait! As always, I am here to support you on your leadership journey. However, I do hope you check out Networking Mastery, because I truly believe I can help folks build a huge thought leadership brand for themselves. In fact, you know how much I love getting a response from you. The first 50 people to respond will be entered in a draw to attend my Deep Dive Personal Branding workshop in September ($400 value). Let me know how else I can help you and I will. Reflect and engage with every incredible moment this summer, make a difference for yourselves and please invest in others. TOMORROW!! ~ Do you ever feel shy, anxious or nervous when at networking events, meetings or one-on-one conversations? Do you find that your introversion can sometimes be a barrier to maximizing your engagement or impact? June 17, 11am & 9pm ET. – Why it’s perfectly okay to be nervous or feel shy. – Why Introverts should network. – How Introverts can prepare, meet people, create winning conversations and excel at the follow-up. – How to boost your confidence and get people to remember you. – How Introverts can make an impact. – Introverts vs. Extroverts: How you can best them. – How to talk to fellow Introverts and how to talk to other Extroverts. Hope you can join us. If you know someone who will benefit from this valuable, please SHARE with them. I’ve done Lunch n’ Learns. I’ve done free live seminars . I’ve done thousands of coffees. But now I am heading into a new arena of business. They are called Webinars. I am slowly realizing the power of scale, reach and accessibility. The other ones above that I mentioned are great for creating connection, sharing knowledge, building brand awareness and thought leadership, generating business leads and more. But webinars, as I am learning from some of the best content experts in the world, is a great way to go. These experts include people like Brendon Burchard, Lewis Howes, Marie Forleo — entrepreneurs who have given people tremendous value and information while expanding their reach and influence. Here is why Webinars rock. 1) You can do it from home – Not that I am going to be in my pyjamas (or maybe I will! Don’t hold me to that), but it’s comfortable and great to have less travel time or costs. 2) Huge Scalability – Webinars have way more scale potential than any other method. Think about it. I may have only 10 or 20 in the beginning. But if I keep delivering value, then more will come. The biggest live audience I ever had was 1,000 people. With a webinar I can eventually have 100,000 people. Okay, that’s Wembley stadium. But the point is, it’s limitless. 3) Better control because it’s your control – One of the challenges of going somewhere else to speak managing everything, from content direction, to tech and logistics. Once I get into a rhythm, it’s going to be that much easier. 4) Easier Accessibility – I always try to make my talk accessible. Often when I speak, there are people in the audience who don’t get a chance to ask a question or they don’t feel comfortable seeing me afterwards, especially when I am surrounded by people who have questions. I can make myself accessible comfortably for as long as I want AND I can capture any and all questions for later. Even better, if someone misses your webinar, you can send them a link to watch it again. 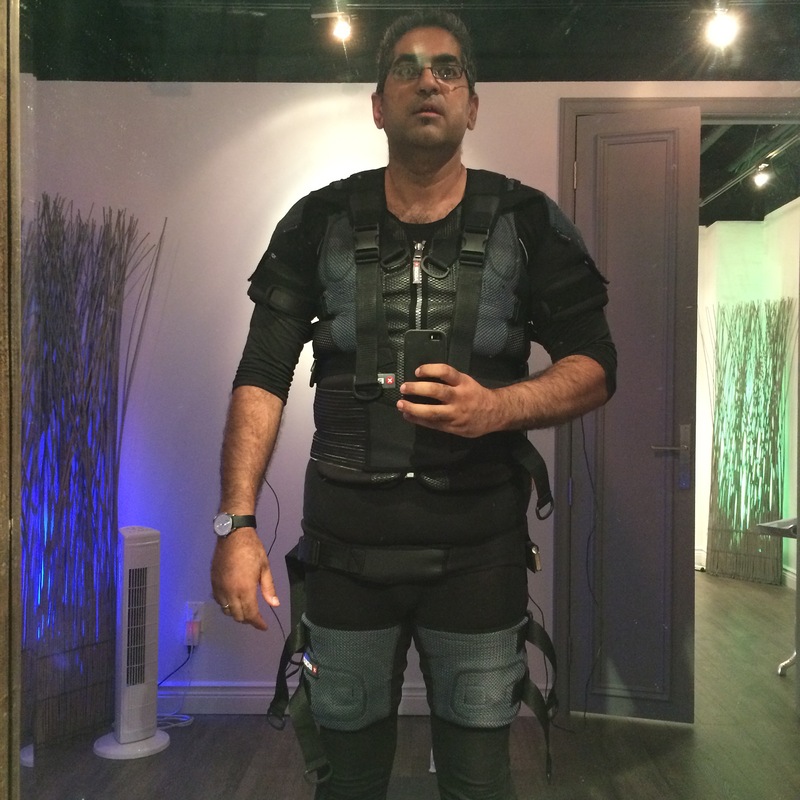 SO….I am ready to try my first webinar. I may not get it right, but I will learn and grow. Are you ready to try one with me and join in? I hope so. 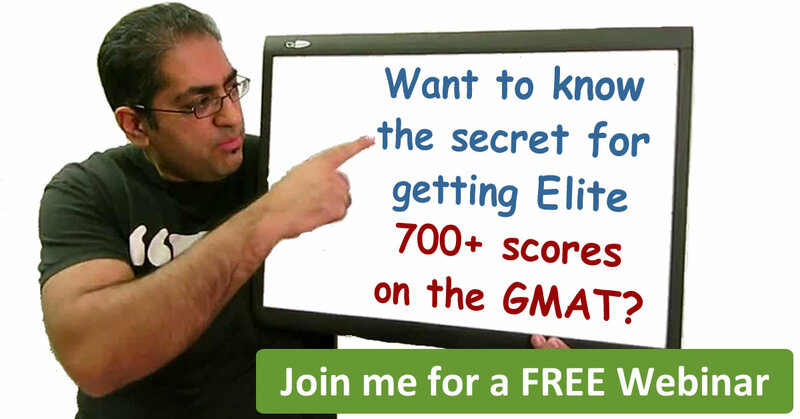 1) “7 Secrets to an Elite 700+ GMAT Score” ~ Many of you know I have been teaching GMAT to thousands of potential MBA students and I am an international author of a GMAT book. Well everyone wants to know how to get a top score, so I’m sharing my 7 best secrets TONIGHT at 9pm ET. Interested? Register here. 2) “How to Land Your First TEDx Talk” ~ I have done 4 (that’s right, F-O-U-R) TEDx talks. I get asked alot how I made this happen. So I am going to share that in another webinar starting TOMOROW May 21. Do you have a big idea that you would love to share with the world? Is it one of your dreams to do a TED talk? Register here. 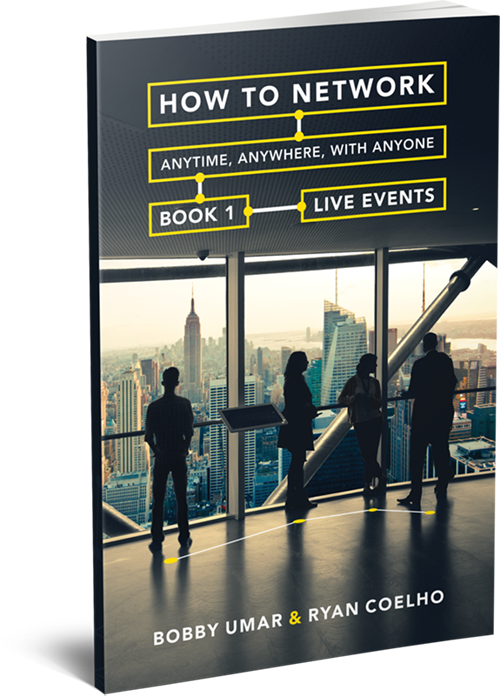 3) “How to Be Memorable at Any Event” ~ I wrote a book last year on ‘How to Network Anytime‘ with my friend Ryan Coelho. I also recently put together a new 12-week program called Networking Mastery. This May 28 Webinar takes some of the best ideas from these two projects and delivers some specific tactics and strategies to help you gain confidence, trust and impact. If you are interested, just sign up for the 2nd Webinar above and you will get an e-mail to register for it later. Or you can wait until I announce the registration early next week on my FB page or Twitter. As I always say, the first step to generating value is to create tremendous value for others. I hope you find this valuable. Let me know your thoughts and comments. I know I would value them. Recently, I shared an event that I am speaking at via social media and e-mail. It’s a 2-day business conference called a “Wealth Building Retreat” and I am doing a 90-minute presentation on ‘Social Media Mastery.‘ This was the image below that I sent along with it. Now most people were pretty excited. But I did get one or two messages questioning the purpose. You should realize that these freebies have been around for a very long time. They exist for a reason and it’s not just about selling. It’s also about giving. They also come in many different yet related forms. I’ll freely admit that I have done each and every single one of those above. Why? Because any business, especially a service business, needs to get in front of people. But it’s not like we’re doing one of those high-pressure sales tactics to sell a timeshare. (although those who run those may argue that they work too). For me, the more important piece is to demonstrate incredible value such that you can sell more business. That is what branded thought leadership is all about! What do these people think? That I am spending my own personal time during business hours to prepare, deliver and engage you with my value-added content just to build good will. Yes, there is some of that. But as a business, I have something to offer that I believe in and I have a desire to build and grow my business. So now you know why we business leaders do this. But what is the best way to do this? It all comes down to delivering incredible mind-blowing high-end world-class value. if you position yourself as a thought leader in your field and your brand promise is to deliver the exact results the attendees need, then you are no selling, you are helping. The ultimate sale comes from the desire to help people solve their problems. So when I meet up with someone for lunch, coffee or a consult, I do all I can to help them in that time. When I create a webinar, I put in tons of fantastic information. If I present live, you can be sure you are getting some of my best world-class content. More importantly, you are getting access to me. In every case, I make myself accessible and responsive because I am also building a relationship. Speaking of relationships, when one of those two friends e-mailed me, he said that ‘live events’ looked a bit ‘scammy’ to him but because I was posting, he trusted it. Good thing then, as this proves the power of relationships. But I also noticed another thing. Live events like this one were more suspicious to digital savvy people. They often prefer free webinars. Many in corporate prefer the lunch n’ learns so they don’t have to leave work. Meanwhile more Gen X and Boomer entrepreneurs preferred the free live events. My point to all of them is that each one of these free events are doing the exact same thing. It’s just a different vehicle. They each deliver amazing value in order to generate even greater value. How? By getting new business for them and helping people add more value to their personal and professional lives, by solving a problem or addressing a need. Either way it’s win-win. Even if you don’t want to ‘buy’ anything, you will learn a ton. If it’s a live event, you will make some great networking connections. Finally, if it’s a coffee or lunch, you might create an even deeper connection. There is tremendous value in that. So if you ever get an invite to any of my free events, webinars or conferences (like the Wealth Building Retreat here), please do check them out. I’d value your support and will do all I can do deliver tremendous value for you. Is there any value in that for you?